Looking for an Azure RemoteApp alternative? 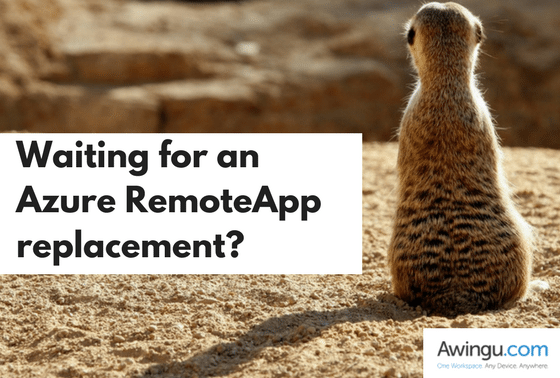 STILL LOOKING FOR A GOOD ALTERNATIVE FOR AZURE REMOTEAPP? Last year, Microsoft announced they will stop with Azure RemoteApp. They plan to shut down the RemoteApp definitely by the end of August 2017 when they will launch a partnership with Citrix and to offer Citrix XenApp Express as a replacement. However, there is a small problem, Citrix`s software is still not available and new purchases of RemoteApp ended on the October 1st 2016. Are you one of the companies stuck in this in-between phase and you are looking for some better solution? Check out what options Microsoft offers at https://docs.microsoft.com/en-us/azure/remoteapp/remoteapp-migrationoptions. Well, whatever makes you stress about this entire situation, it`s time to exhale and relax. This is a great opportunity for you to get to know a better alternative since our solution is available right now and offers a much richer proposition than RemoteApp. How is Awingu different from Azure RemoteApp? Awingu offers an online workspace. We enable Single Sign-On to all your cloud applications and access to all your files, whether on internal file shares or stored in cloud solutions. This is wrapped in security while allowing easy collaboration. Awingu is available across clouds and thus enables hybrid deployments. Want to deploy Awingu on Azure? Awingu on Azure is extremely easy to install. You can deploy a full instance in the Azure Marketplace with Awingu All-in-One. With just 5 minutes of setup time, you can deploy and configure the Awingu Virtual Appliance and a full back-end (app servers, Active Directory, file servers). The only thing you still need to do is install your application(s) on the application servers, configure your applications and create users in Active Directory. Citrix solutions come with many challenges. There are many installations and components needed to set up a remote network. There is no clear, transparent pricing. If you wish to have all the functionalities, you must purchase different products. Upgrading Citrix-based environments can be a real painful process. We’ve seen too many cases where upgrades are so time consuming and expensive (e.g. because you need to build a fully new solution) that businesses are just not upgrading. They prefer to stay on older, often unsupported, versions. We offer one solution that covers all the functionalities. Ready to try out Awingu? Click here and get your 14-days free trial!